When we did our initial CME configuration we copied over the ‘ringtones.tar’ file and extracted it to the folder ‘CME_Ringtones’. Now it’s time to configure the CME instance to use them. RingList.xml – defines the available default ringers for a phone. DistinctiveRingList.xml – defines the extension or line ringtones available to the phone. 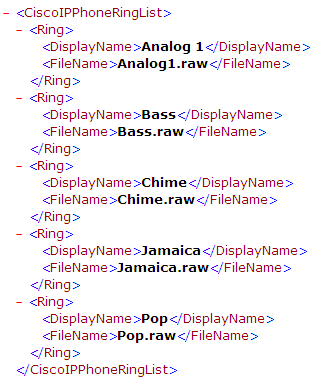 This is a copy of the RingList.xml that comes in the ringtones.tar file. It’s fairly straight forward so I won’t explain the syntax. Note that I have to use the ‘alias’ command on each file instance since the files are not in the root directory of the flash. After I loaded these lines into configuration the phones detected the new ringtones after a reboot.